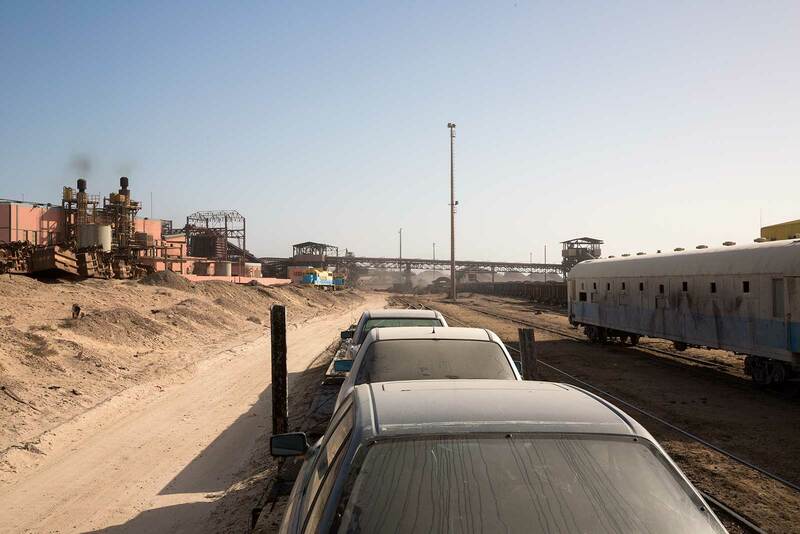 I Finally Did It: Travelling On The Infamous Iron Ore Train In Mauritania. | Travel Photography Blog by Nisa Maier and Ulli Maier. It was an adventurous moment, mixed with utter excitement; after 25 years of having the infamous Iron Ore Train on my bucket list, I finally parked my car in front of one of the sheds in a dusty side street in the outskirts of Nouadhibou, where the responsible officials spend their working hours. I actually found the place by luck, I didn’t ask anyone for directions, I just drove my car up and down the peninsula of Nouadhibou. I wanted to get an overview of one of the most dilapidated cities I had ever seen. This is where Iron Ore Train ends, one of the longest trains in the world, which makes Nouadhibou the most important area in poor Mauritania. When A White Western Woman Enters The Office Of The Mauritanian Railway Authorities. 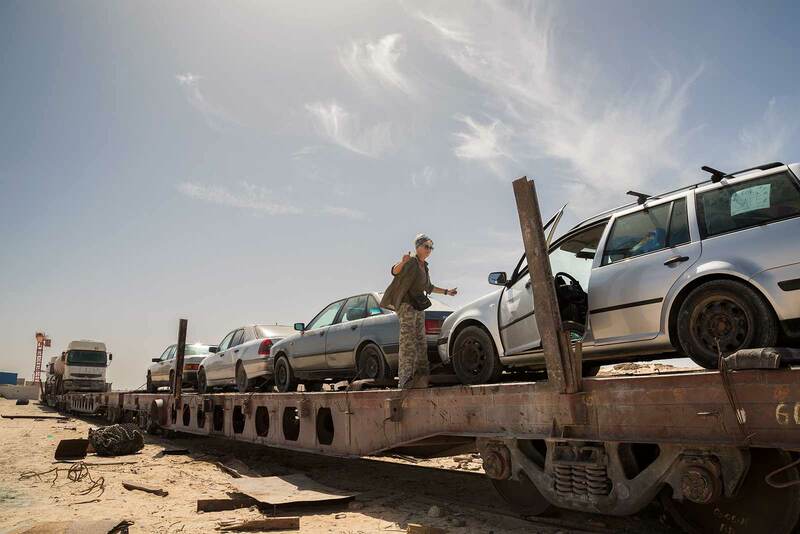 So here I was, walking into the shed of the Mauritanian Railway Authorities to enquire about the possibility to transport my car and myself to Choum, approximately 500 km east of Nouadhibou. The deal was done in the blink of an eye. With one place still available, I could put my car on the train. I only had to decide immediately, since the train was about to leave. I quickly checked my water and food supply, which would last for some days and gave it a go. 120 Euros for the car plus myself was a fair price and within the next couple of minutes, my car was loaded and tied to a platform for vehicles. My ticket said no passengers in the car, but nobody obliged when I asked if I could spend the journey in or on the car. I started making arrangements for the coming 30 hours: water, food, snacks were all at hand, towel, toothbrush and toilet paper on the dashboard, cameras and mobile phone as well within easy reach. Check, check, double check. It took hours of turning switches, pulling the wagons and platforms up and down the tracks, back and forth to have them all in right position ready for the long journey East. Finally, around 8pm, after seven hours of waiting (talk about an immediate decision making), everything was set and the train took off honking repeatedly, taking the endless semicircle track out of Nouadhibou. A Long, Rocking Night, The Most Beautiful Sunrise And A Frustrating Awakening. Even with 40° Celsius during daytime, temperatures drop fast and I was happy that I had blankets and a sleeping bag nearby. Lying outstretched in the back of my station wagon, the night was almost comfortable… well not really, but better than expected. Nights in the desert are cold and pitch-black. I knew this from my trips across the Sahara Desert in the 70s & 80s and so I wasn’t able to see anything when the train stopped at night. I just heard voices somewhere in the distance. The position of my platform was near the end of the train, so I was not bothered by anyone during the night. Morning arrived and I watched a beautiful sunrise while the train tugged leisurely into Choum. 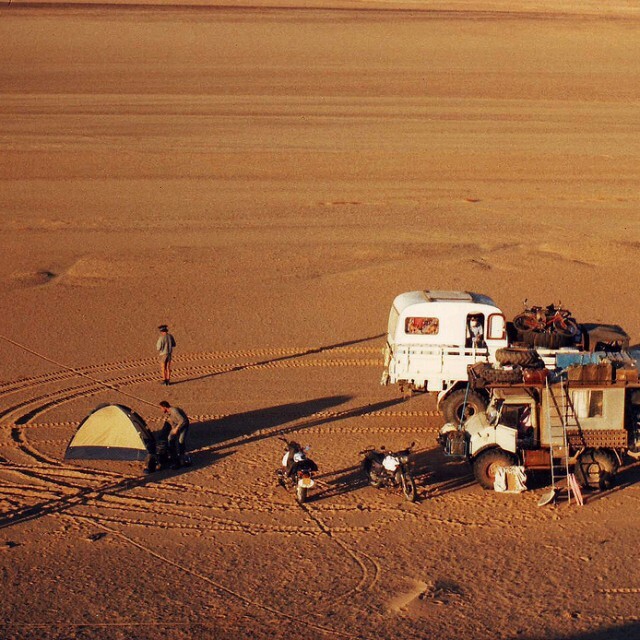 The wind had covered everything with layers of sand mixed with dust of iron ore from the wagons. Choum was actually the place where I had planned to get off, but I quickly realised that there was no loading off point for cars. “Sorry Madam, next stop for unloading cars is Zouérat” I was told, though in the guys in Nouadhibou had told me otherwise. Unloading cars in Choum was only recently stopped, so there was no chance for me to get off here. This was a bit upsetting, because it would put me approximately 200 km in the wrong direction, but I couldn’t do anything about it. 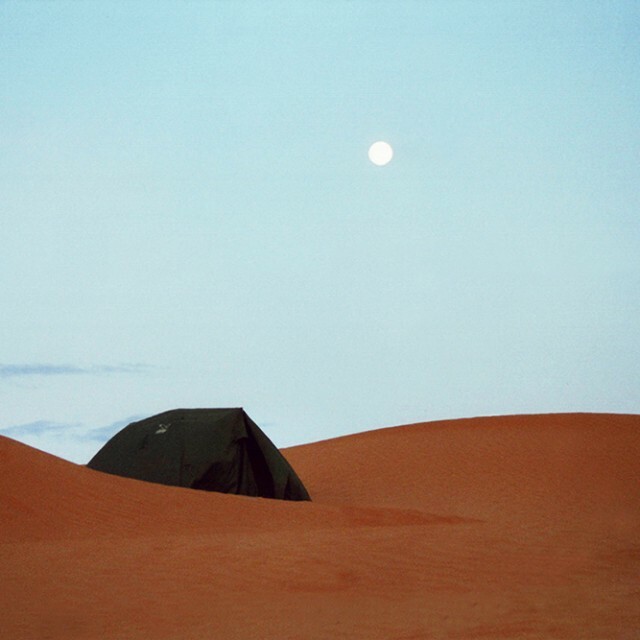 I sat back down on top of my car and looked into the Mauritanian desert. The toilet situation was a bit of a hassle. It was a new experience for sure. Hanging out of the car, hanging on to the platform needed concentration, one wrong move and you could fall off. I got the hang of it after a couple of times. Another few hours further, with lots of stops in between, the train finally pulled into Zouérat. Again, the turning of switches, pulling and pushing of wagons took two hours until my platform finally came to a halt somewhere in the middle of nowhere. All I could see was how the Diesel locomotive pulled away. Close by, though lightyears away, I could see the unloading facility for cars. 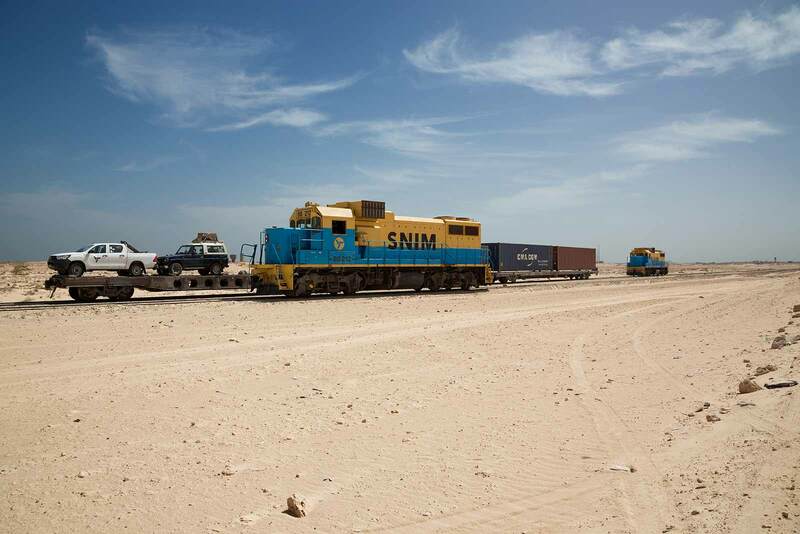 Another platform was already loaded for the trip back to Nouadhibou, while my car was just a stone throw away, without a chance of getting off. This was very annoying and put my patience to the test. I asked several officers and workers when my car would be unloaded and I got the same answer every time “In a while Madam”. In Africa, “in a while” can mean one hour, five hours, 12 hours or more than 24 hours. Time runs slow here. So, after waiting another three hours in the soaring heat, with someone occasionally walking by, noticing my impatience yet not doing anything, my nerves went rock bottom. 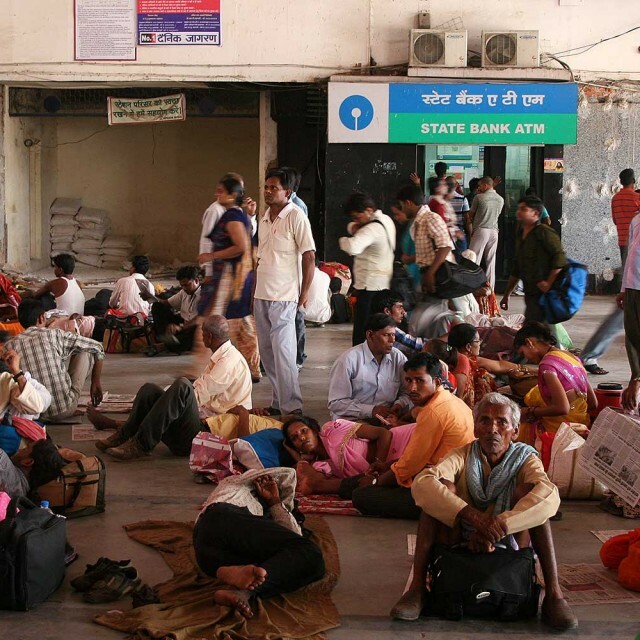 I stepped down from platform and walked along the railway tracks up to the station office and demanded to speak to the station master. Mauritanians are generally very polite people but are definitely not used to talking to Western (female) tourists. The country is dominated by males, especially in this business. Politeness is very helpful and I demanded politely to see the station master. It took a while until one of the men started to move to show me the way to his office. After a couple of minutes, this guy came out of his office with some other officers in tow, and was frankly quite irritated to see a Western woman demanding to speak to him. I explained my situation and he and the others didn’t seem to be bothered at all and said that my car would be unloaded in a while. Then it was over, my nerves collapsed and I started crying. My breakdown changed the entire situation. The officers stared at me and my crying, not sure whether to be astonished or shocked and immediately started talking in their local language. After a minute of discussion, the station master said I should stop crying, they will immediately start the Diesel locomotive and will unload my car within 10 minutes. What more can I say? The station master guided me to his car, drove me back to my car and presented me with a big box of water bottles. During my breakdown, I might have also mentioned that I was running out of water, which I hoped would increase the unloading process, and he must have really felt sorry for me. It didn’t take long and my platform was towed up and down the tracks to bring me to the unloading section. The car was unlocked from the platform, I drove down and followed the station masters car until I was on the right road back to Choum where I actually had planned to get off. This evening I stopped near a military checkpoint along the road and asked for permission to sleep nearby, since there was no hotel to be found anywhere. I set up my tent and fell asleep immediately. 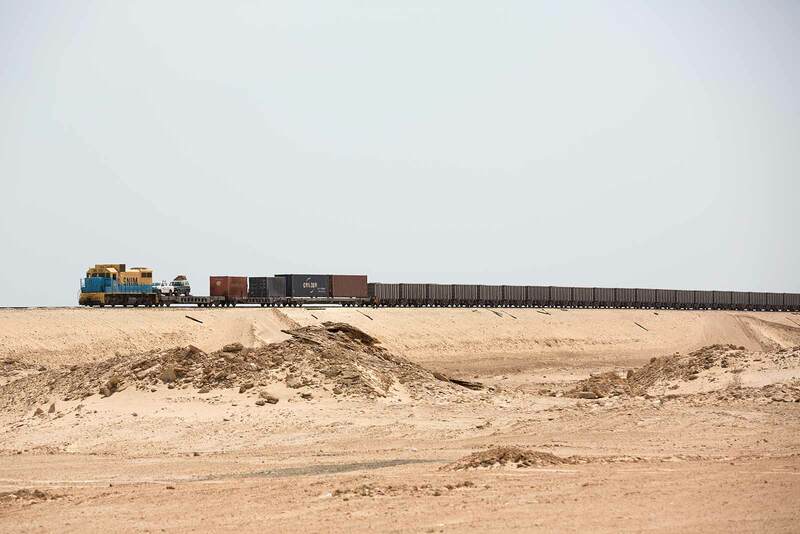 The Iron Ore Train fills its 2.5 km of wagons (which is the second longest on earth) with the iron ore and then heads back to the coastal city of Nouadhibou. 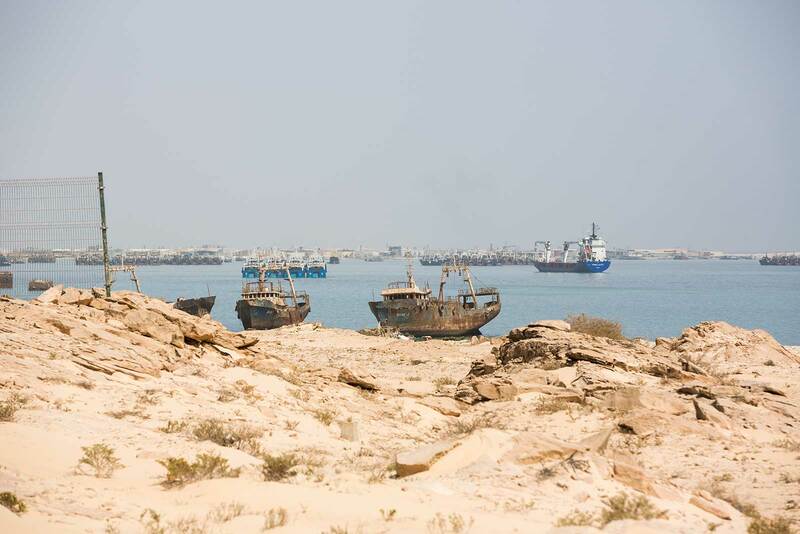 The view off the coast of Mauritania’s Bay of Nouadhibou used to be spotted with rusting hulks in every direction. Today, this Ship Breaking Yard is almost gone, due to an injection of capital from the Chinese. The Mauritanian Railways opened in 1963. It consists of a single, 704 km railway line linking the iron mining centre of Zouérat with the port of Nouadhibou. 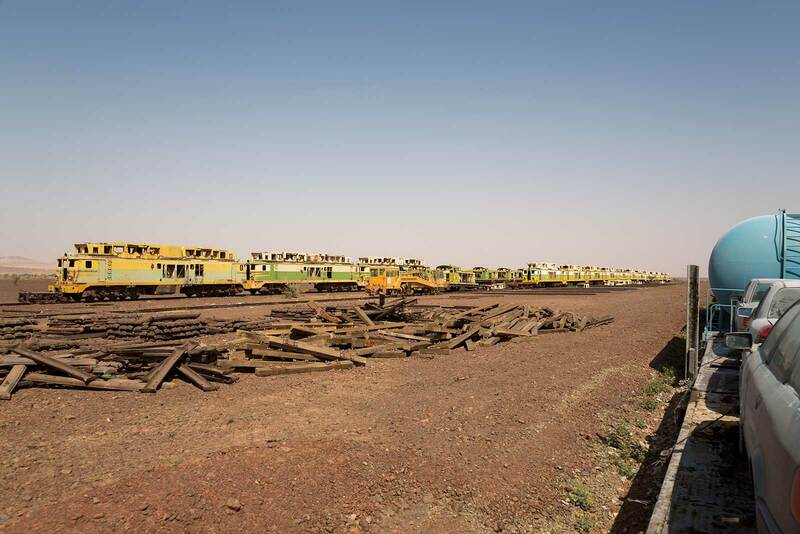 Two or three trains make a daily departure to pick up iron ore from a mine in Eastern Mauritania. 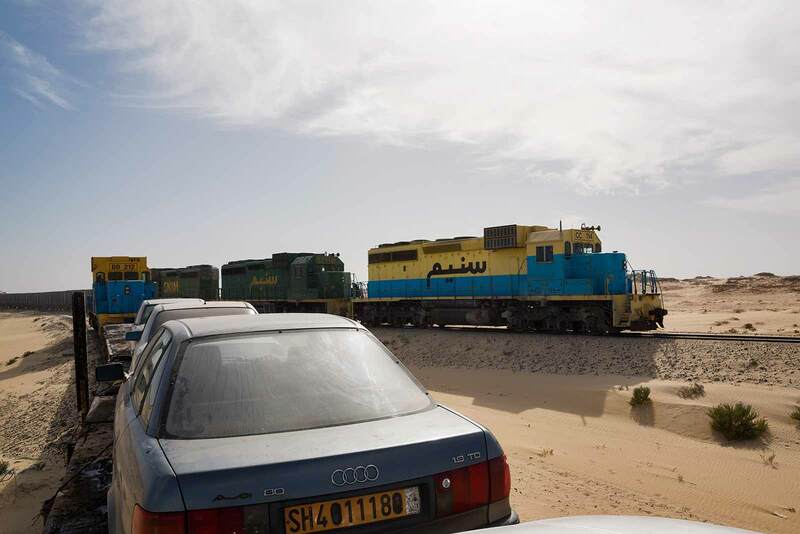 Uploading my car onto the Iron Ore Train in Nouadhibou was already an adventure itself. 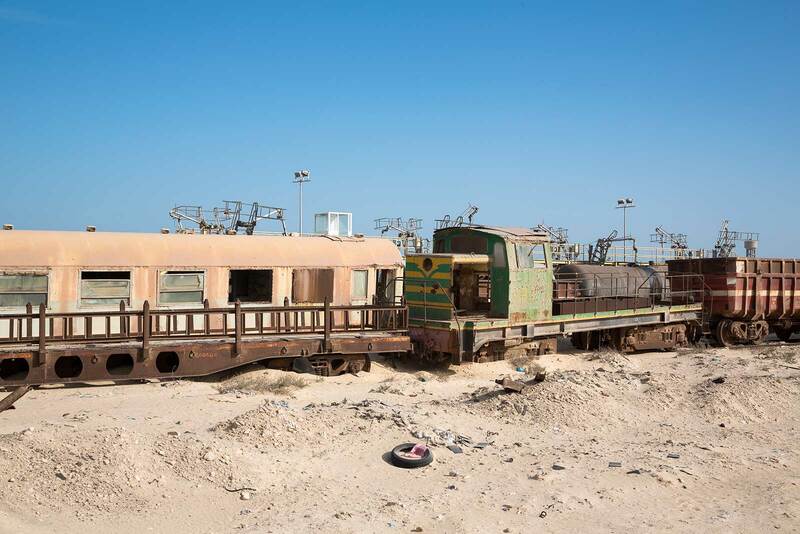 While the Iron Ore Train snakes its way through Mauritania, you’ll come across wrecks from all sorts of vehicles – here, old Diesel locomotives that were once in use have been parked. Wrecks are a normal sight when riding through Mauritania on the Iron Ore Train. 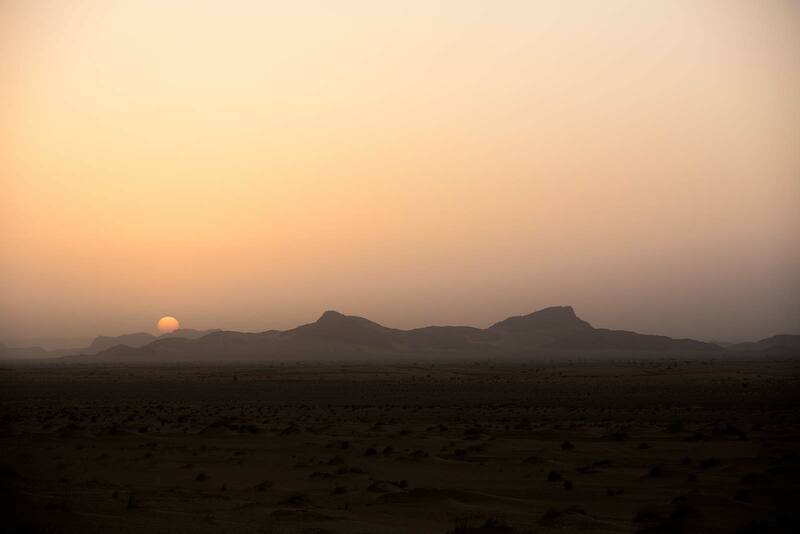 One thing is for sure: the sunset and sunrise while on the Iron Ore Train in Mauritania were some of the most beautiful ones I have ever encountered. 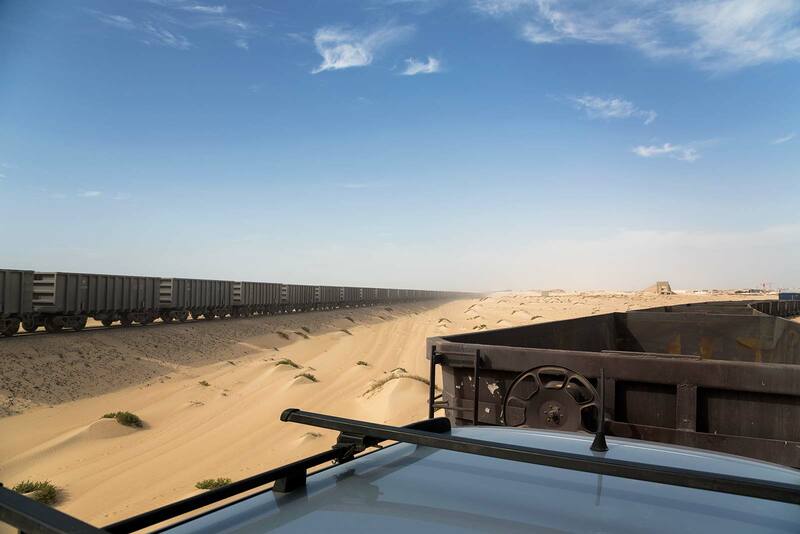 Sitting on top of the Iron Ore Train, while looking at nothing around you but the Mauritanian desert, is an experience of a lifetime. 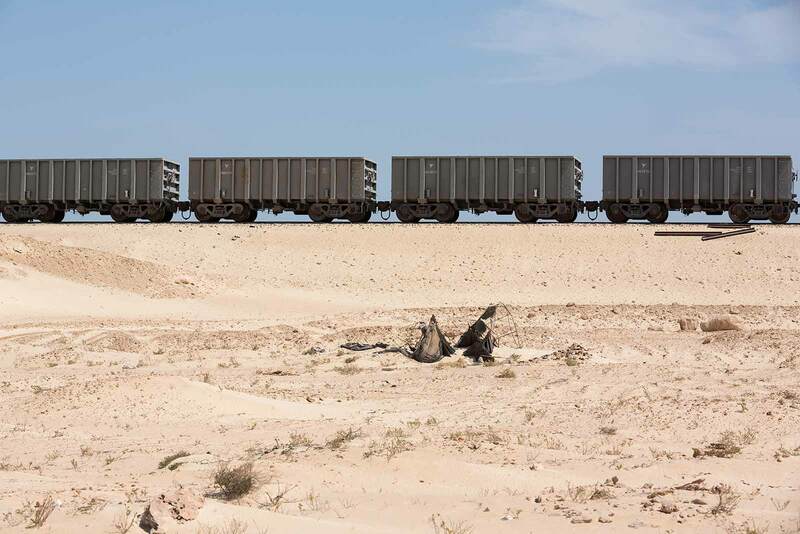 The bulk cargo train travels from the Sahara desert to the coast through dry nowhere to transport valuable minerals across Mauritania. 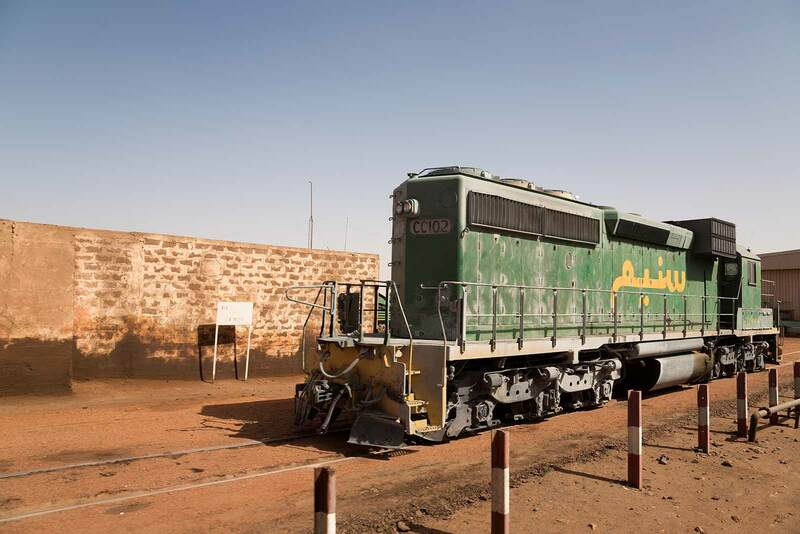 The Mauritania Railway serves not only as the sole connection between remote locations and the country’s only major shipping port, Nouadhibou, but as free transport for locals seeking to travel from isolated communities to the coast. 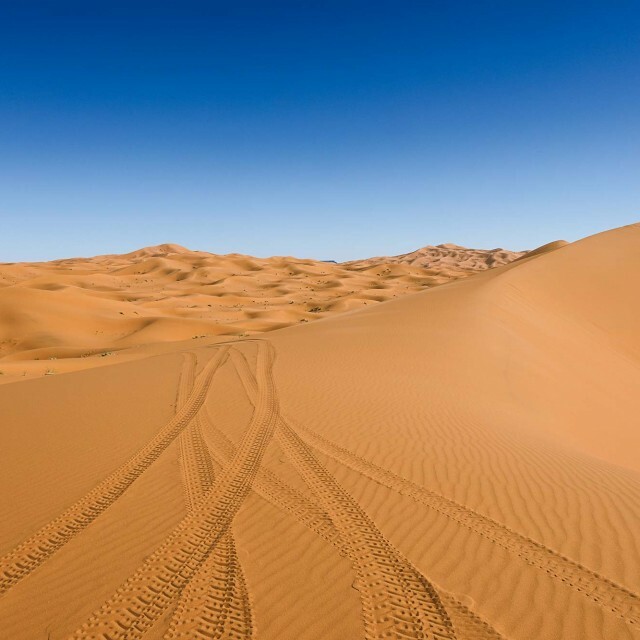 The Sahara desert lived up to its nickname, ‘the White Man’s Grave’, as temperatures during the day sore to a blistering 50° Celsius. The Iron Ore Train is up to 2.5 kilometres long, making it one of the longest and heaviest in the world. It normally consist of 3 or 4 diesel-electric EMD locomotives, around 200 cars each carrying up to 84 tons of iron ore, and 2-3 service cars. The total traffic averages is 16.6 million tons per year. 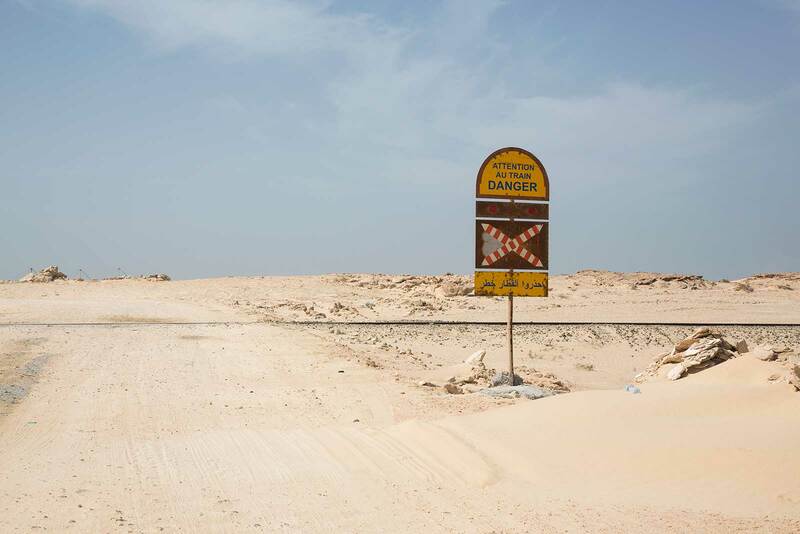 Nouadhibou is the second largest city in Mauritania and serves as a major commercial centre and is the country’s economic capital, due to being the final stop of the Iron Ore Train. Thanks for the incredible photos! I hope to ride the iron ore train later this year but I had never even considered the logistics you mentioned. Can’t even imagine what it was like to wait all those hours in the heat for your car to be unloaded! THANK YOU for this! I loved every moment of it. It is my dream to do this as well and I think it may actually happen in a few weeks. I found this post from the Thorntree forum. I want to ride on the top of the train, and I will be traveling alone. Do you think that would be ok for a woman going alone, if I don’t have my own car? I have a ton of travel experience, but I guess I am just wondering about when it gets dark and if anyone will hassle me. I’m thinking of those situations when I’m the only woman in a space full of men who aren’t used to being around women. ps crying DOES help sometimes, as much as I hate it to come to that point! Can’t wait to read about your other adventures! Concerning your question, we can let you know that it shouldn’t be a problem travelling the iron ore train as a woman. In the passenger part of the train, there will be women for sure (although we were not there, but saw some getting on and off), so you won’t be “alone”. In general, Mauritanian men are very friendly and are not interested in trouble/hassle and if you have lots of travel experience and therefore know how to act (or better NOT to act), you’ll be fine. Take care & all the best for your trip! If you have photos/stories, please let us know. Would be great to read about your experience.